Whey Protein Isolates are the purest form of whey protein that exists. By using Whey Protein Isolates as the primary protein source, Optimum Nutrition are able to pack 24 grams of the purest, muscle-building protein per serving, with a lot less of the fat, cholesterol, lactose, and other stuff that you can do without. Directions: Add one rounded scoop of Chocolate Mint Gold Standard Whey to a glass filled with 180 - 240ml water, before stirring (or shaking in a shaker cup) until dissolved. Add fresh or frozen fruits, peanut butter, coconut or other ingredients to your shake to make it even more delicious. Trying adding Gold Standard Whey to muffins, cookies, brownies for a protein boost! Protein Blend (Whey Protein (Milk) Isolates [contains Emulsifier: Soy Lecithin], Whey Protein (Milk) Concentrate, Whey Peptides (Milk)), Fat-Reduced Cocoa Powder, Flavourings, Creamer (Vegetable Oil, Maltodextrin, Milk Protein), Salt, Sweeteners (Acesulfame Potassium, Sucralose), Thickener (Cellulose Gel) Enzyme Complex (Amylase, Protease, Cellulase, Beta-D-Galactosidase, Lipase). 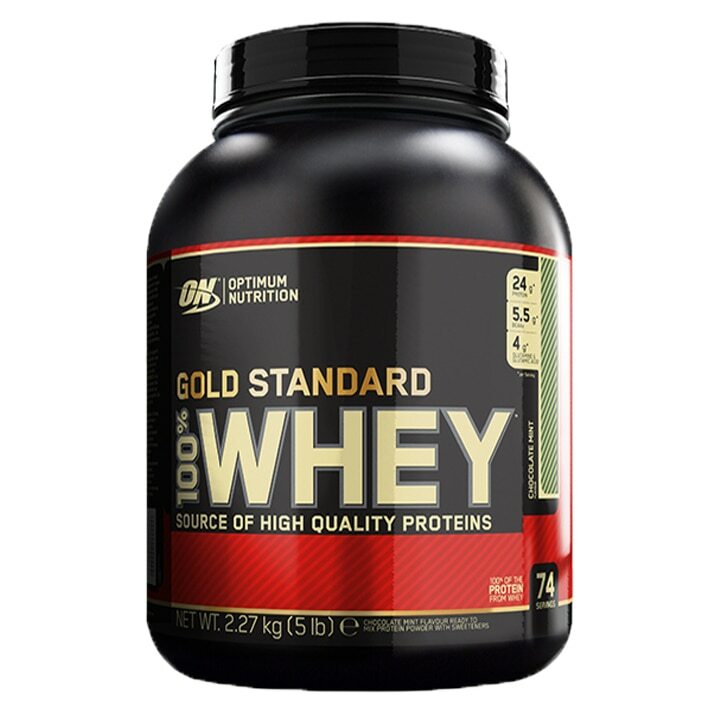 Optimum Nutrition Gold Standard 100% Whey Chocolate Mint is rated 4.9 out of 5 by 41.